Mr B. was injured at work when a fork lift truck accidentally pushed some pallets into him. He received compensation for his injuries and loss of earnings from his employer. Our Lawyer took on the case and pursued a claim against the employer who had failed to enforce reasonable safety precautions to reduce the risk of such an accident occurring. 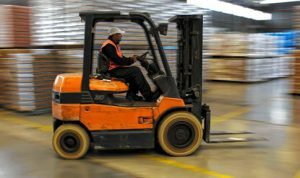 Our client was in the store room, when a fellow worker driving a fork lift truck loaded with goods hit a stack of pallets next to our client and continued to shunt them forward into him. The stack of pallets were above head height. The driver of the fork lift truck only stopped his machine when shouted at by a manager who happened to see the accident and luckily intervened before more serious damage was done. All employers must, by law, have employer’s liability insurance to cover the cost of compensating employees who are injured at work in situations like these. This is important so employees like Mr B. can receive fair compensation without causing financial hardship to their employer. Our client received £4,000 compensation for the injuries and loss of income that resulted from the accident. This article was added on Thursday, April 16th, 2015 at 3:30 pm and is categorised under . Both comments and pings are currently closed. Error: Error validating access token: Session has expired on Saturday, 09-Mar-19 13:12:58 PST. The current time is Wednesday, 24-Apr-19 20:01:58 PDT.